Fig. 3-6-3-1 shows the number of first-time inmates (refers to those who were admitted to a penal institution for the first time) / reimprisoned inmates (refers to those who were admitted to a penal institution for the second or more time; hereinafter the same in this subsection) and the rate of reimprisoned inmates (refers to the percentage of reimprisoned inmates to all inmates; hereinafter the same in this subsection) over the last 21 years (See Appendix 2-8 for the number of new inmates in 2009 by type of offense and history of imprisonment). The number of reimprisoned inmates continued increasing every year from 1999 on but then remained stable from 2007 on, and was 15,518 in 2009. The rate of reimprisoned inmates continued to rise every year from 2004 on and was 54.8% in 2009. 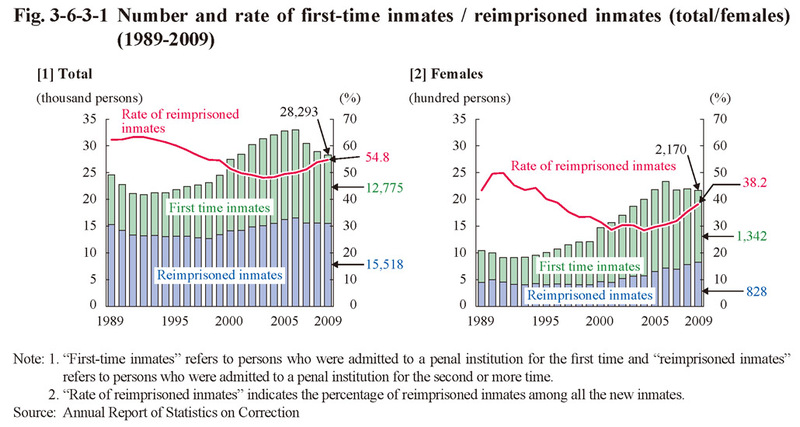 With females the number of reimprisoned inmates has been on an increasing trend from 2000 on and was 828 in 2009. The rate of reimprisoned inmates was low when compared with males, but has continued to increase every year from 2005 on.